Reading nooks are often cozy, comfy, messy spots – usually consisting of a beat up chair, an old blanket, and a big pile of books crammed in an unused corner. But if your reading nook is slowly turning into an eyesore, it might be time to consider an overhaul. Of course, upgrading to a look that has a little more style doesn’t have to mean sacrificing comfort. Midcentury modern furniture combines the best of both worlds, with striking, iconic silhouettes that have a designer feel, but that are specifically made to be ergonomic and comfortable to use. Why It Works: Midcentury modern furniture was modeled as the furniture of the future, and in many ways, that ended up being true: some of the most popular chairs of the early-to-mid 20th century have ended up becoming some of the most iconic and recognizable statement pieces in homes today. That makes midcentury lounge chairs a particularly good choice for a reading nook; they stand out as special in a larger living room, which can transform that low-traffic eyesore corner into a focal point of the space. Better still, midcentury pieces are incredibly easy to mix and match, even for a novice designer. You’ll want to decide whether to err on the side of wood or plastic midcentury pieces, but beyond that, getting together the few things you need for a reading nook is a snap, and they’re practically guaranteed to look good together, because they share a similar design aesthetic. Get The Look: So what all do you need for a reading nook? Of course, you want to start with a chair. This one is a leather Retropolitan lounge chair, but midcentury reproduction manufacturers offer a wealth of sizes, shapes, and styles, so you can find one that’s comfy for the way you sit (I personally love curling up in an Egg Chair and stretching out in an Eames Lounge Chair). If you’re going the plastic-and-chrome route rather than wood, add in a tiny Tulip Table so you have somewhere to stack your books (and maybe a cup of tea or glass of wine! ), and a small decorative Ottoman if you want to put your feet up. 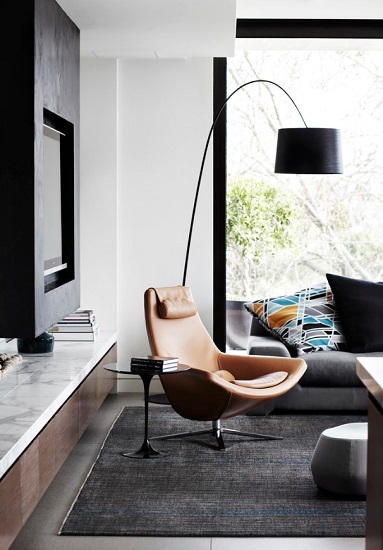 Adding an Arc Lamp to your reading corner is a great way to double down on your midcentury stylish impact, and it’ll also give you great control over your reading light, letting you direct the light where you need it most. Those three items make a pretty cohesive cluster on their own, but if you’re worried about your reading nook’s place in your larger living area, you could set all this furniture on top of an area rug – either a small round one to keep it contained on its own, or a larger Rectangular Rug to help anchor it to the rest of your decor. Building a remote, relaxing spot to curl up with a good book doesn’t have to mean devoting part of your living room to a beat-up old chair and reading lamp. A few new, coordinated pieces are all you need to transform that space into a midcentury-style marvel. This entry was posted in Decorating Ideas and Tips, Latest Trends and tagged book nook, midcentury modern design, midcentury style furniture, reading chairs, reading corner, reading nooks.